Fairy tales do exist—just ask Gillian Malone! When rancher Logan Malone drags his feet on finding love, his five-year-old daughter, Gillian, persuades a local matchmaker to help her find a new mother. Enter Delaney Holmes, a Washington socialite fleeing from the press after being left at the altar. 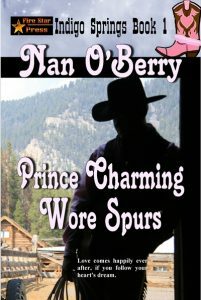 Swearing off men, she takes the job as a nanny to a precocious five-year-old in a backwoods Texas town called Indigo Springs. But Logan Malone is a six-foot cowboy hero complete with white hat and a swagger that puts John Wayne to shame. Can he put away the ghost of Gillian's mother to follow the rules of the Fairy Tale Code in order to win Delaney's heart? Or will Delaney's secret past keep him from proposing? With true love at stake, there’s only one thing for sure—in this real life fairy tale, PRINCE CHARMING WORE SPURS—and it’s going to take some powerful magic to ensure a “happily ever after” ending!